São José dos Campos, Brazil, 2015-6-17 — /Travel PR News/ — Embraer S.A. announced today at the 51st International Paris Air Show an agreement with United Airlines to add additional E175 jets to the United Express fleet. The agreement consists of ten firm orders, which will be included in Embraer’s 2015 second-quarter backlog. Additionally, Embraer expects that United or one of the carriers that operates as United Express will convert options for 18 aircraft to firm orders in the near term. The ten firm orders have an estimated value of USD 444 million based on current list price. “We are thrilled to add more E175s to the regional fleet. The E175 will be used to primarily replace older, less efficient 50 seat regional jets while providing an improved passenger experience” said Ron Baur, VP Fleet. Embraer is the only manufacturer to develop a modern family of four airplanes specifically targeted for the 70- to 130-seat segment. Since the formal launch of the program in 1999, E-Jets have redefined the traditional concept of regional aircraft by operating across a range of business applications. The first E-Jet entered revenue service in 2004. United Airlines and United Express operate an average of nearly 5,000 flights a day to 373 airports across six continents. In 2014, United and United Express operated nearly two million flights carrying 138 million customers. United is proud to have the world’s most comprehensive route network, including U.S. mainland hubs in Chicago, Denver, Houston, Los Angeles, New York/Newark, San Francisco and Washington, D.C. United operates nearly 700 mainline aircraft, and this year, the airline anticipates taking delivery of 34 new Boeing aircraft, including the 787-9 and the 737-900ER. 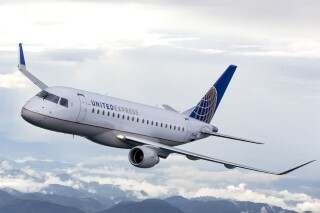 United is also welcoming 49 new Embraer E175 aircraft to United Express. The airline is a founding member of Star Alliance, which provides service to 193 countries via 27 member airlines. More than 84,000 United employees reside in every U.S. state and in countries around the world. For more information, visit united.com , follow @United on Twitter or connect on Facebook. The common stock of United’s parent, United Continental Holdings, Inc., is traded on the NYSE under the symbol UAL. Embraer is the world’s leading manufacturer of commercial jets that seat up to 130 passengers. Nearly 900 aircraft from the 37, 44 and 50-seat ERJ 145 family of regional jets have been delivered to airlines since their introduction in 1996. The E-Jet family includes four larger aircraft that have between 70 and 130 seats. The E170, E175, E190 and E195 set the standard in their category with their advanced engineering, high degree of efficiency, spacious, ergonomic cabins with two-by-two seating, and attractive operating economics. Since E-Jets entered revenue service in 2004, Embraer has received more than 1,500 firm orders for this aircraft family. More than 1,100 have been delivered. In 2013, Embraer launched E-Jets E2, the second generation of its E-Jets family of commercial aircraft comprised of three new aircraft – E175-E2, E190-E2, E195-E2 – seating from 70 to 130 passengers. The E190-E2 is expected to enter service in the first half of 2018. The E195-E2 is slated to enter service in 2019 and the E175-E2 in 2020. This entry was posted in Airlines, Airports, Business, Transportation, Travel, Travel Management, Travel Marketing, Travel Services and tagged E175 jets, Embraer, Paris Air Show, Paulo Cesar Silva, United Airlines, United Express fleet. Bookmark the permalink.